AcqURL is not only a bookmark manager, it is the simplest and most powerful way to find, organize and access any data you choose. 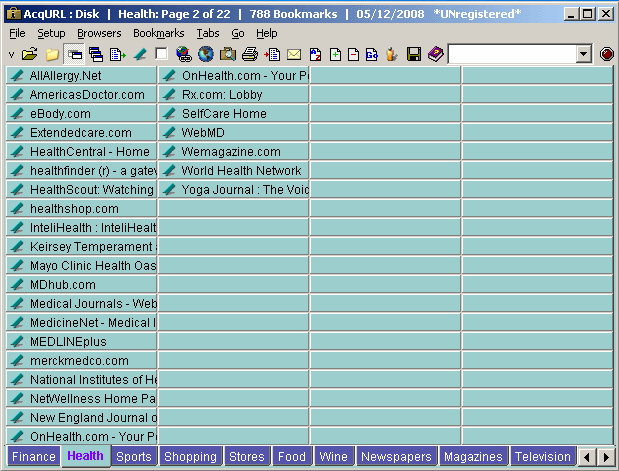 The program includes a bookmark manager, FTP client, a file launcher and a user defined meta search engine. Updated in this version: Added separate options in Setup for: Capture Web Page IP. Capture Web Page Description. Web Page Icon - Capture, Auto-update.Added print preview, with margin adjustment, line spacing and zoom. Added HTML links preview, with template, multiple column and new browser instance options. Added viewing of Cookie info. Added an option to display password popup in expanded mode. Added display of bookmark notes on password popup expanded screen. Added ability to launch all bookmarks in a group with one click. Added bookmarking of current browser window when multiple browser windowsare open. Added colored bookmark buttons. Added optional multiple row tabs. Improved page rename function. Improved page password function.